(Leah Hogsten | The Salt Lake Tribune) l-r Cyprus' Logan Hendrickson celebrates the win with teammates Tate Foote and Alex Foster. Cyprus High School boys' basketball team defeated Hillcrest High School 77-61 during their game Tuesday, January 30, 2018 in Magna. (Leah Hogsten | The Salt Lake Tribune) Cyprus' Alex Foster celebrates after hitting back to back 3-pointers in the game. Cyprus High School boys' basketball team defeated Hillcrest High School 77-61 during their game Tuesday, January 30, 2018 in Magna. (Leah Hogsten | The Salt Lake Tribune) Cyprus' Josh Amasio hits the net. Cyprus High School boys' basketball team defeated Hillcrest High School 77-61 during their game Tuesday, January 30, 2018 in Magna. (Leah Hogsten | The Salt Lake Tribune) Cyprus' Alex Foster and Ben Ellsworth try to shot Hillcrest's Tyson Flores. Cyprus High School boys' basketball team defeated Hillcrest High School 77-61 during their game Tuesday, January 30, 2018 in Magna. (Leah Hogsten | The Salt Lake Tribune) The starters react to the play of their teammates after they were replaced during the last minute of the game. 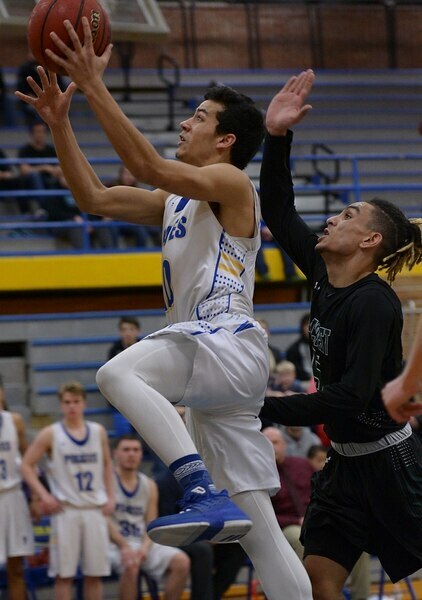 Cyprus High School boys' basketball team defeated Hillcrest High School 77-61 during their game Tuesday, January 30, 2018 in Magna. (Leah Hogsten | The Salt Lake Tribune) Cyprus' Alex Foster shoots around Hillcrest defense. Cyprus High School boys' basketball team defeated Hillcrest High School 77-61 during their game Tuesday, January 30, 2018 in Magna. (Leah Hogsten | The Salt Lake Tribune) Hillcrest's Bassel Tekarli slips around Cyprus' Alex Foster. Cyprus High School boys' basketball team defeated Hillcrest High School 77-61 during their game Tuesday, January 30, 2018 in Magna. Magna • It looked as though Cyprus and Hillcrest were preparing for a fourth-quarter battle after three physical, hard-fought periods Tuesday night. 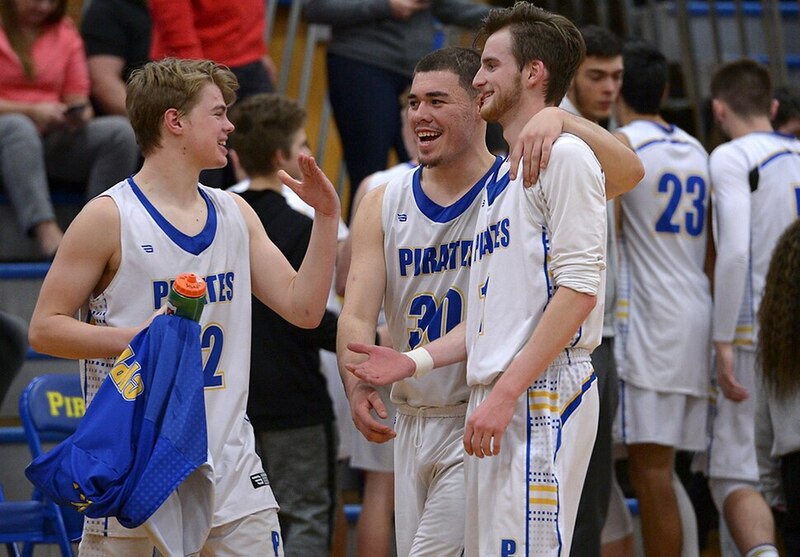 But a light went on for the home team in the final eight minutes as the Pirates connected on six 3-pointers on their way to a 34-point quarter and an impressive 77-61 victory. Cyprus, which started Region 2 with two losses, has won four of its last five with one of those wins over league-leading Kearns. Alex Foster led the barrage of 3-pointers. He had Cyprus’ ancient gym rocking. He scored 12 of his 19 points in the decisive quarter on four 3-pointers. The Pirates also got nine fourth-quarter points from Josh Amasio in what Smith, a Cyprus alum, said was one of the better periods his team has played this season. Amasio finished with 21 points. This wasn’t an easy win, though. It was a physical battle where the teams came close to coming to blows at one point. Hillcrest, battling to stay in the league race, got 22 points from McKay Ashby, 16 from Box Ashby and 13 from Bassel Tekarli. The Huskies had a 25-point third quarter and cut Cyrpus’ once-commanding lead to two points. But when Cyprus got hot and the Magna crowd started to roar, the Huskies simply could not match that fourth-quarter 3-point barrage. Cyprus had the only Region 2 win against high-flying Kearns entering Tuesday’s games. 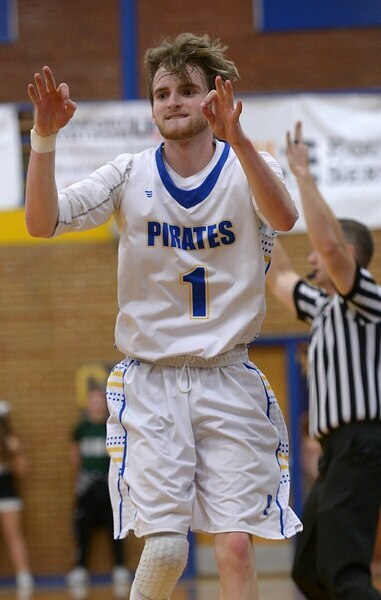 After beating Hillcrest, the Pirates look poised to battle Granger and Kearns the rest of the way. • Cyprus scores 34 points in the fourth quarter to break open a close game. • The Pirates get 21 points from Josh Amasio and 19 from Alex Foster to win their fourth game in five tries. • McKay Ashby leads Hillcrest with 22.